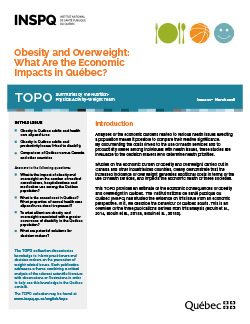 This TOPO provides an estimate of the economic consequences of obesity and overweight in Québec. The Institut national de santé publique du Québec (INSPQ) has studied the evidence on this issue from an economic perspective. In it, we describe the behaviour of Québec adults. This is an overview of the three publications derived from this analysis (Blouin et al., 2014, Blouin et al., 2015a, Blouin et al., 2015b). The economic costs associated with overweight and obesity in Québec reached nearly $3B in 2011 for the four types of costs addressed by the INSPQ’s studies: medical consultations ($110M), hospitalizations ($1.3B), medication ($860M) and disability ($630M). These results do not include all costs associated with overweight and obesity. For instance, productivity losses linked to absenteeism and premature mortality were excluded from the calculation. As in Québec, obesity and overweight are associated with significant economic costs in other Canadian provinces and industrialized countries. To reduce the economic burden of obesity, each government must adopt a portfolio of measures that incorporate both educational interventions and changes in the built, sociocultural, economic, and political environments to make them more conducive to physical activity and healthy eating. The adoption of such measures will lead to better health within the population, which will also lessen the pressure exerted by health-related expenditures on Québec’s budget and result in productivity increases for the economy. The social changes that led to the economic burden currently associated with obesity have taken decades to occur; current efforts will thus need to be intensified to create environments that make healthy choices easier to make.